One of the hottest toys for Christmas in 2017 were Fingerlings, which made a finger monkey toy one of the most popular and sought-after gifts for the holidays. The popular toy was widely sold through online and brick and mortar retail stores. In 2017, there were six main types of Fingerlings, and other brands came out with other variations of the finger monkey toys. Fingerlings are made by WowWee, a specialty toy manufacturer that focuses on robotics and hi-tech toys. Toys R’ Us carried all the latest Fingerlings, but after declaring bankruptcy in 2018, few stores carry the extremely popular finger monkey toys. Although Walmart carries some Fingerlings, the largest variety is now found online, particularly on Amazon. Fingerlings react to touch and sound, and respond to stimuli by blinking and blowing kisses. They have over 40 different reactions, and sing, dance, and burp. They also have a small microphone that picks up sounds, which helps them react to specific cues. Although these finger monkey toys are small, they are rather sophisticated mini robots. They took nearly an entire year to perfect and build, and are great childrens toys because they help demonstrate positive emotional reactions like happiness, love, and excitement. The brands success launched several other amazing products, and re-popularized finger toys, puppets, and accessories. More children’s toys are now understanding the importance of teaching young children good emotional health, and are now turning play time in to secret learning sessions. These toys are also excellent for children who may have behavioral issues or difficulty socializing. Below are some of the best finger monkey toys, puppets, toys, and accessories that will make any kid ecstatic. One of the most popular WowWee Fingerlings is the Pink Glitter Monkey. The bright pink and glitter makes it look aesthetically unique and fun, and is great for any kid who lists Pink among their favorite colors. This Fingerling is featured as an Amazon Choice, meaning it is one of the highest selling items, and one of the most popular products in the toy department. The color helps personify a fun, bright, and vibrant personality. This pink glitter Fingerling is also super sparkly, and the wide-open eyes look very life like. A great toy for children of any age, adults also have found this Fingerling as a great office companion. It can swing upside down from your finger, and blow you kisses. It comes in five different colors, including White (Sugar), Pink (Rose), Blue (Amelia), Purple (Kiki), and Teal (Quincy). Each color deviation includes a Fingerling with a different name, allowing you to get an extra level of personalization. Quincy is the only one that has hair color different from his body color, which ads an extra level of flair. Customer reviews are very positive, and the toy has transcended generational groups and been enjoyed by customers from all walks of life and ages. 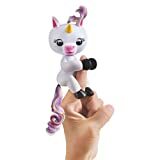 Gigi the unicorn is another member of the Fingerlings family. One of the coolest finger monkey toys available, Gigi is white, with pink, purple, and white hair and tail. The other variations include Alika (purple) and Gemma (Pink). The baby Unicorn line features soft, slowing tails, and specially colored hooves. The Fingerlings Baby Unicorn is one of six Fingerlings designs, and will even go to sleep in your hands. It also is one of the most popular toys on Amazon. Customers raved about how great of a gift it was for their children and grandchildren. Whether you already have Fingerlings or not, this Fingerlings Playset is a great buy. It includes both a monkey playground, perfect for any finger monkey toys, and a baby monkey Fingerling. The playset includes a swing (which is detachable) and monkey bars, and is pink, blue, purple, and yellow, and comes with Liv the baby monkey. There are also 3 other playset to choose from. You can upgrade to the Liv and Simona set, which includes two baby finger monkey toys, and a playground. You can also select the jungle gym option. 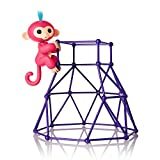 The jungle gym is purple, and comes with Aimee, a pink baby monkey. Aimee has her own personality, and is described as competitive. She is a rare coral color. She can hang upside down, and use her hands to grip the jungle gym. The last option includes Milly (purple), Willy (blue), and a purple and yellow see-saw. A crank controls the see-saw, and you can also hang the pair upside down. Customers commend the durability of the play sets, and gave very favorable reviews. 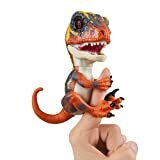 Wowee’s Raptor Fingerling is perfect for kids, or adults, who love dinosaurs. His name is Blaze, and watch out, because he is fierce! He will strongly grip your finger, and react with boisterous roars, but is also fiercely loyal. He also snaps, and in untamed mode, Blaze will roar, hiss, and chomp. Blaze is a velociraptor, and can be tamed. If you choose to tame your ferocious raptor, Blaze will purr and nuzzle. You can switch him from tame to untamed by flipping a switch, so you get two fun personalities in one toy. This carrying case is a great accessory for anyone who has trouble transporting toys safety, or that wants their child to learn how to responsibly take care of their toys. The case can comfortably fit finger monkey toys, Fingerlings, and action figures. It comes with a detachable shoulder strap made specifically for children, making it easy for your little one to tote around. The front features a mesh window, so you can easily peer inside the bag. It can hold up to four baby monkeys, or a variety of other toys. This would be a great way for your kid to easily bring along building blocks, toy cars, crayons, and coloring book. It comes in three different colors (pink, blue, and green), and features one storage compartment. It is soft, and safe for children five and older. Even if your child is younger than five, it is still a great way for parents to easily and effortlessly carry their child’s toys, or to keep an extra stash of toys in the car. This bag is also backed by a 100% satisfaction guarantee, and is part of Amazon’s Free Returns programs. It also comes with free shipping! Reviews are very positive, with customer’s praising how much their children loved their bags. This is a great buy for anyone who has Fingerlings, finger monkey toys, or any product that uses AG13 batteries. As a bonus, it comes with a mini Philips screwdriver. The value is second to none, as the cost to buy 20 of these batteries is nearly 200% higher in most retail stores. You never have to worry about running out of batteries, or not being able to replace dead ones in your electronics, or your child’s toy. This super saver has perfect reviews on Amazon. Hatchimals are another extremely popular toy. This 4 pack is great for anyone who is looking for value, trying to expand their collection, or wants a great package to start collecting Hatchimals. There are over 70 Hatchimals to collect, and 4 is a great place to start. These work by holding the eggs in the palm of your hands, and slowing rubbing the heart on the egg. 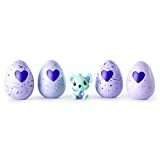 The egg hearts come out the box purple, and when the egg turns pink, the Hatchimal egg is ready to hatch. Then, you simply gently touch the egg to crack it open. When the egg hatches, one of 70 different Hatchimals will emerge. It may take up to 25 minutes for the Hatchimal egg heart to turn from purple to pink, and the entire hatching process can take 40 minutes. All Hatchimals have wings, and each belongs to a different family. The color of speckles on the egg indicates which family the Hatchimal belongs to. You can keep track of how many Hatchimals you have by checking the Hatchimals chart. For anyone that loves a toy with a sense of adventure, these SinoArt Slingshot Animal toy set is a great gift. The set includes a monkey, pig, frog, duck, cow, and rooster. The product works by latching the head of the animal on your fingers, and pulling its backside back with your opposite hand. When you release the backend, the toy slingshots forward. Its soft exterior makes it a great texture to safety sling, and it poses far less risk than traditional slingshots. Each animal also makes its own, special sound when it is slingshotted. It is made for children ten years old and up, and is a safe way for your child to have fun. It can travel up to 21 feet forward, leaving endless possibilities for fun. 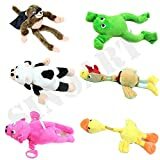 These toys are also loved by dogs, who enjoy chasing them after kids sling them forward. This set creates fun for the whole family. Adults also love them, and customers have given them to people, and animals, of all ages. Great for storytelling, and teaching kids how to identify different animals, Better Line’s 20-piece story time finger puppet set can really make bed time that much more enjoyable. The cloth finger puppets fit on big and small fingers alike, and comes with 14 different animals, and a human family of 6. Also great for creative children who love to story-tell, the finger puppets have an elastic band to ensure they fit snug on anyone’s fingers. 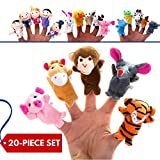 With a total of 20 finger puppets, multiple people can play and participate in active and engaging stories and role playing games. These puppets help encourage language development and creativity, and would be a great way to help young children learn names, colors, and animals. Other uses include using these puppets as a tool in occupational and speech therapy, and as a tool for speech and behavioral therapists to work with clients. They are also a great way to help teach conflict resolution, letting parents, teachers, and therapists act out fictional situations with ease. These are also easy to store, and fold up compactly. Customers love the laundry list of ways to use these finger puppets, with many parents and grandparents using them to make story time for their young one’s fun and interactive. 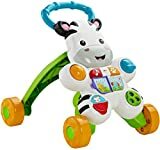 Made for children over the age of 6 months, this interactive Zebra 2-in-1 Walker from Fisher Price is great for children who are just learning to stand and walk. The walker is sturdy, and infants and young toddlers can use it as support when they first start to learn how to walk. The toy can be used standing up, walking, or sitting down. It can easily be used by infants who have just learned how to sit up, and is the perfect size for a young child to sit and play with. The product helps to nurture and develop gross motor skills, sensory learning, and curiosity. The toy features seven different activities. The front has a button that plays music when it is activated, and the toy teaches counting, numbers, and the a, b, c’s. It is super colorful, and will definitely get, and keep, the attention of any infant. The Walker is a Zebra, and the stripes offer a nice background to the colorful front. The wheels are a bright yellow, and the legs are a lime green. The bright colors help heighten and engage your infant’s curiosity, and also teach your young one colors. With so many different shapes, the textures and layout offer plenty of interesting ways for your infant to entertain themselves. There is a blue handlebar on top that helps support your little one when they use the walker to help them become mobile. It eases the difficulties for infants and toddlers when they first attempt to walk, and helps them become comfortable being mobile for the first time. The finger activities help increase motor skills, and buttons and peek a boo games encourage children to use their fingers to accomplish tasks. Fisher price is an industry leader in creating toys that help young minds learn. Customers love how this toy grows with their child, and can be used for years. For anyone with young children, finding fun, interactive toys that your child will remain interested in playing with can be hard. So many toys are on the market, and your options include everything from finger monkey toys to tablets. Finding out what your child will like requires some research. Look in to what other children enjoy, and what toys are most popular. Also consider what activities your kid likes, and what maintains their interest. Finding a toy that can foster your child’s curiosity and creativity helps them develop, and learn emotional and behavioral skills. Interactive toys have advanced to the point that children have access to robotic playmates easily and cheaply. And despite the recent advancements in technology, classic toys like finger puppets are still terrific ways to help your child learn how to use their creativity and imaginations. Toys like Fingerlings maintain a child’s interest long term, and help teach how being kind to others is a great trait to have. Children go up fast, so finding a toy that can grow up with your kid is a great way to prevent having a stockpile of unused toys. Amazon helps fill the gap of Toys R Us closing, and creates a way to obtain some of the most popular toys that sell-out in stores.